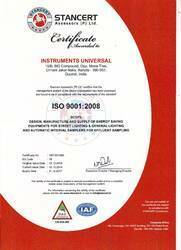 We, Instruments Universal, an ISO 9001:2008 certified company started operating in the year 1980, as a manufacturer, supplier and exporter of Automation Products. In this range, we offer Street Light Automation Products, Street Light Monitoring Systems and Automatic Street Light Controller. Manufactured in adherence with the set industry standards, these products are widely used in the municipal corporations, town ships and highway. Further, due to the optimum quality of our products, our customer, ‘Vadodara Mahanagar Seva Sadan’ received first ever National Award by BEE for energy conservation in street lighting. Our infrastructure facility is built on a large area of land for allowing sufficient work space and flexibility in the production unit. Due to this, we have installed more than 1000 Intelligent Streetlight controllers and have installed more than 1000 Sampling Systems all over the abroad. Also, we are the India’s only flame proof sampler manufacturer. Our optimum quality of products has helped us in spreading our customer base in Indian Subcontinent, East Asia, South Asia and Canada. We are greatly indebted to our mentor, Mr. Divyang M. Kapadia, who has always supported and guided us, during challenging times in the market. Our complete workforce wishes to work in his leadership, to reach new heights and mile stones of success. “To become an internationally recognized company in the field of Automation and IT To remain a reliable and preferred partner in our customer’s growth To supply Automation and high-tech information technologies worldwide To continuously support the advancement and know-how of our employees Besides dynamic growth, our team is characterized by its exceptional stability. This is result of a well developed company culture and a highly motivated team of engineers." We are also engaged in offering our customers with comprehensive end-to-end services. Our solutions are aimed at providing superior energy solutions and convenience for the customers. These services are delivered by our team of highly qualified and skilled professionals. Our professionals are fully proficient in providing optimum consultation, installation, training, maintenance and support solutions to the customers. Furthermore, we also provide automation for jobs with customized PLCs and SCADA to suit specific requirements of our customers. We also render automation services for plant lighting using GSM technology, which ensures 30% energy saving. Our extensive range of products is extensively used by our customers in various applications across the sectors. These have been designed and manufactured to suit the diverse requirements of our customers. Further, these can easily be customized and tailor-made as per the exact specifications of the clients. We are supported by a team of qualified professionals, which is instrumental in providing customers with cutting edge technical solutions for our customers. All our professionals are highly qualified and experienced in developing embedded systems and customized solutions. With engineering and electronic degrees, they are proficient in MCS51 series, ST7 series of microcontrollers, assembly language, C, C++, Visual Basic and Java. We provide all our team members with regular trainings sessions and seminars for helping them updated with latest trends and advancements in the market. For us true success comes only when our customers are completely satisfied with the quality and functionality of our products. Hence, all our endeavors are aimed towards ensuring optimal satisfaction levels and achieving highest order of profitability for all our customers. Our innovative and cost effective solutions are designed to provide our customers with competitive advantage in the market. We also work hard to ensure that all the deliveries are done as per stipulated time schedules. In addition, we also offer flexible payment modes and ample support services. Apart from this, we have also worked with India’s largest fertilizers and petrochemical complex GSFC Ltd. at Vadodara. Our important customer, ‘Vadodara Mahanagar Seva Sadan’ received first ever National Award by BEE for energy conservation in street lighting. 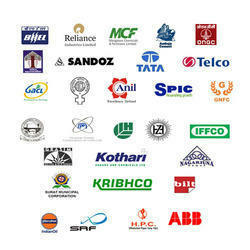 We have become a known and trusted name in the field of Industrial Automation Products. Despite, being a new player in the market, we have achieved a reputation and respect in the market. Offered products are highly sturdy and known for their optimum performance.